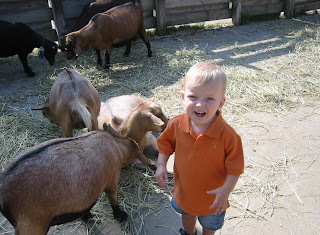 R, G and I recently went to the petting zoo area at the Columbus Zoo. They learned all about the animals that produce mommy's favorite kind of cheese. And yes, I dressed them in matching orange shirts a la, J&K+8. It was a brilliant idea...G is a fast mover and I could find them both in a flash. Highly recommend it for busy public outings. Goat cheese is by far my favorite... even though the origins stink! Yay that your boys got to have such an awesome trip! Who gets to comb goats' fur/hair everyday? Awesome idea on the shirts! 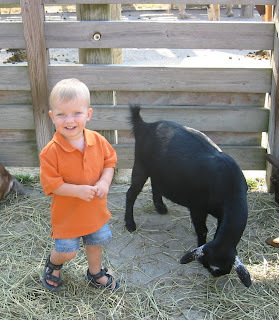 And this brings back memories of a picture I have of Tristan in the middle of a bunch of goats brushing them down. I use any excuse/opportunity to dress my kids in matching outfits. Now safety can be added to the list. 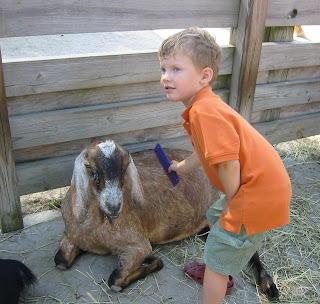 The thought of kids using the goat comb on myself just made me a little ill, though! Goat petting creeps me out a little too. Our zoo uses bristle brushes. Thankfully the sink is right outside the pin. Orange still ranks up there with Jake's faves, although blue and green are pushing their way in. BTW, G is looking older to me. Did he just have a big growth spurt? You have a great eye, Jenn. Yes, G has shot up big time this summer. 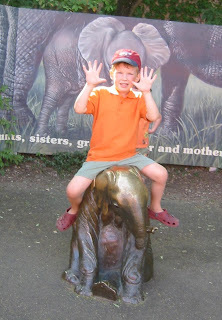 At his 15 month visit he was still in the 50% for height and 10% for weight. By 18 months he was almost 75% for height and between 25-50% for weight. Now, just a month later, he looks really tall to me and the shirt he is wearing in the pic is a 2T from J&J (I went there a few weeks ago and went a little crazy since I hadn't shopped there in more than two years while SPH was in school). BTW...I've caught A running around our house with Frank's cat brush. My distaste to children using animal brushes is not limited to goats apparently. Ew.